My husband, Pascal Carr, and I live and work on our croft on the Isle of Eigg. 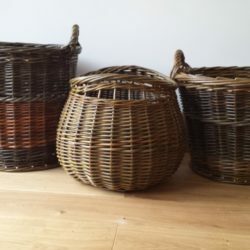 We produce handmade baskets of traditional and contemporary design from willow that we grow organically on our croft. We leave the bark on and do not strip or process our willow in any way which allows the natural colours of the different species to be used in our baskets. Growing the willow is an integral part of our making process; cutting by hand and drying and grading the harvest gives such an intimate connection with our raw material that it truly inspires us. The versatility and uniqueness of each individual willow rod becomes the dictating factor and driving force in the design and form of our work. We sell direct at national and international events and craft fairs, we exhibit at galleries and specialist outlets and offer demonstrations and courses for all levels of experience, we have taught throughout the UK as well as in France and Spain. We undertake individual commissions for new work and repairs and we can also service large orders to any part of the world. We are the basket makers for the American television series based in 18th century Highland Scotland called Outlander.